Fabtech have long term relationships with leading global geomembrane and geotextile material manufactures. Fabtech has specific expertise in material selection for all applications. Fabtech manages the global supply chain from material selection and procurment to international logistics and delivery. 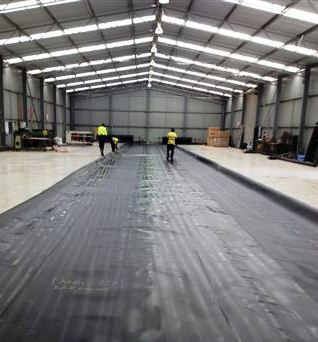 Fabtech is one of the largest importers of geomembrane material in Australia. High Density Polyethylene (HDPE) geomembranes, also known as polyethylene high-density (PEHD), is a polyethylene thermoplastic made from petroleum. HDPE geomembranes provide excellent durability and resistance properties due to its large strength to density ratio. HDPE is commonly recycled making it eco-friendly and environmentally friendly. HDPE is used in Geomembrane Dam Liners and Fabtech is a proud HDPE installer, particularly with Landfill and resevoir lining. Linear low-density polyethylene (LLDPE) geomembranes are very flexible, tear resistant and durable. LLDPE geomembranes are very flexible, with a higher tensile break elongation than HDPE, however HDPE geomembranes have excellent ultraviolet (UV) and chemical resistance. LLDPE geomembranes can be used in Landfill liner systems, Geomembrane Dam Liners and Tank liners.